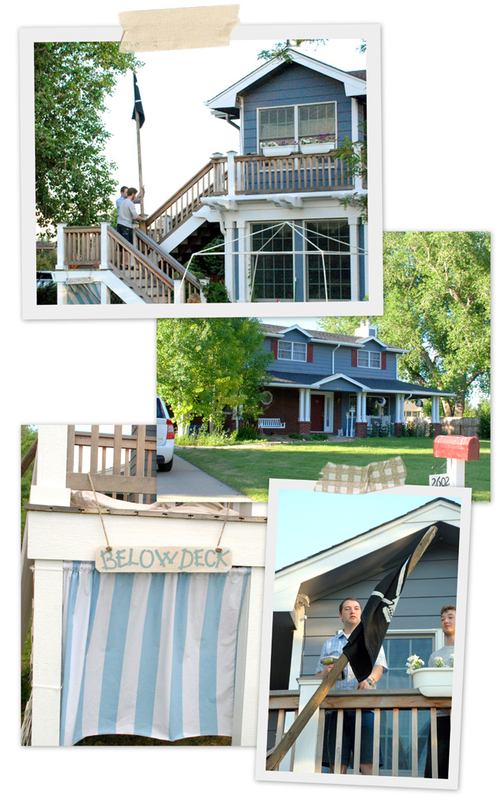 For the party my parents transformed their patio deck into a ships' deck. 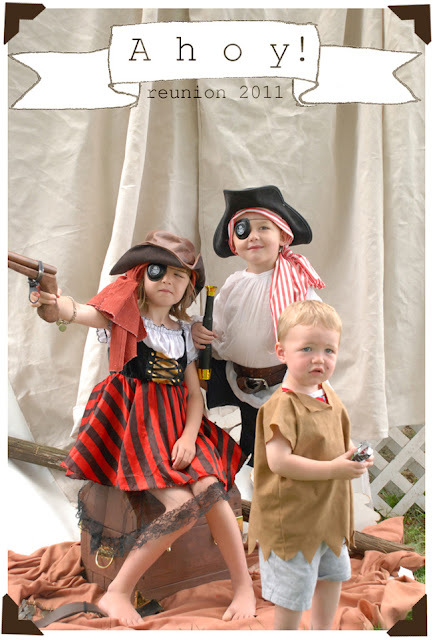 The jolly roger was hoisted up on the mast and the below deck area was designated for the grand kids to play as the ships' cook, making all kinds of fun creations with Grandma's collection of food toys. In the Muppet Treasure Island movie (a family favorite) a silly half-whit character (played by Fozzie the Bear) refers to the ocean as the big blue wet thing. Therefore we thought it both hilarious and appropriate to put a sign by the pool that said "big blue wet thing". 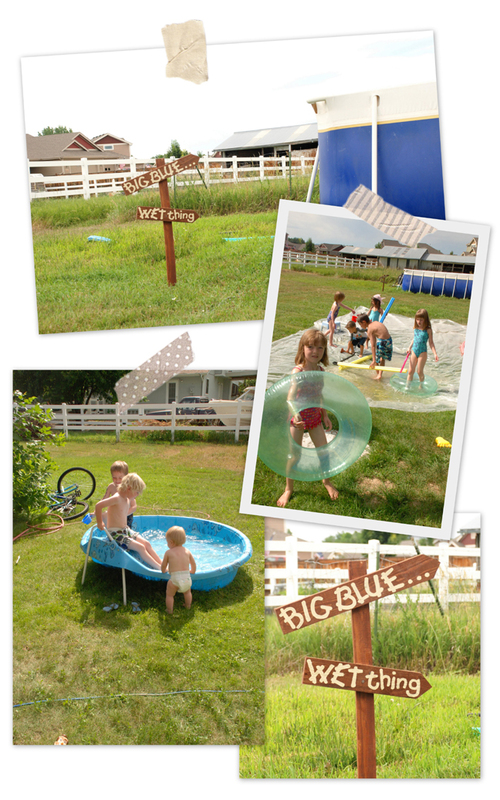 Swimming and playing on the slip 'n' slide are always things we look forward to when visiting grandma and grandpas house! My Brother and Sister-in-law set up an awesome pirate trading post. 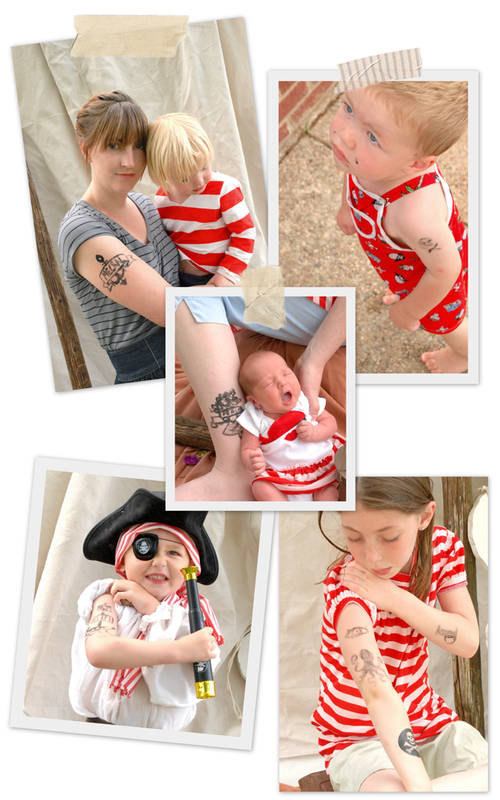 They brought a collection of inexpensive or thrifted pirate-y treasures for the kids to take by trading rocks and other found objects. This was a huge hit with the kids. 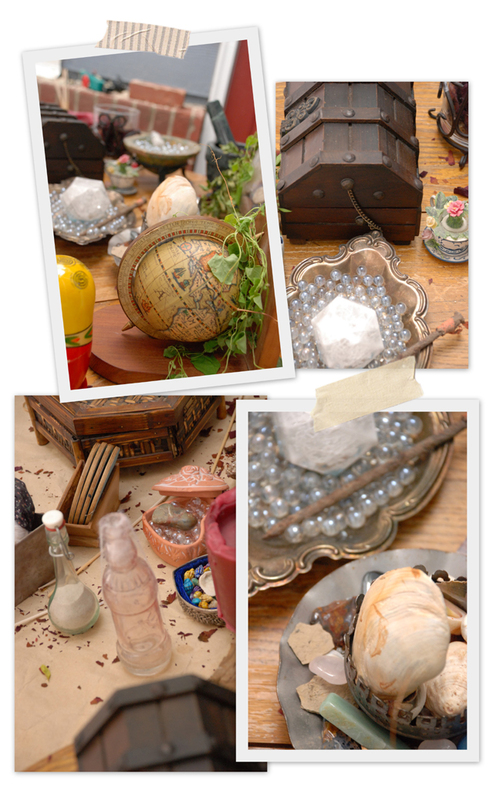 They were so enamored with the fact that they could really keep the fantastical treasures they traded for. So fun! 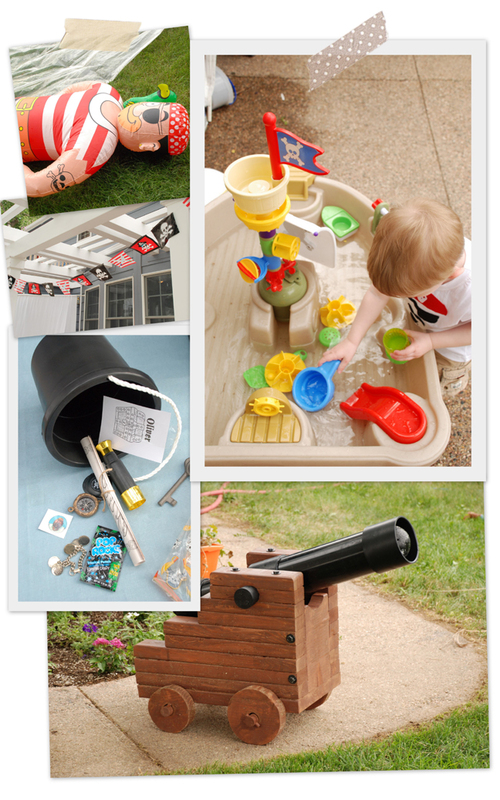 There was a pirate ship water table for the youngest buccaneers to play at (which they loved), and each grandchild received a bucket of booty to take home. Our inflatable pirate dummy joined in all the fun and his pirate-y presence was just what the party needed. Probably the best thing of all was that my dad built working cannons from black PVC and fire extinguishers! The extinguishers created realistic looking smoke as they propelled Styrofoam balls all the way across the the yard! We had such fun battling it out in cannon wars! 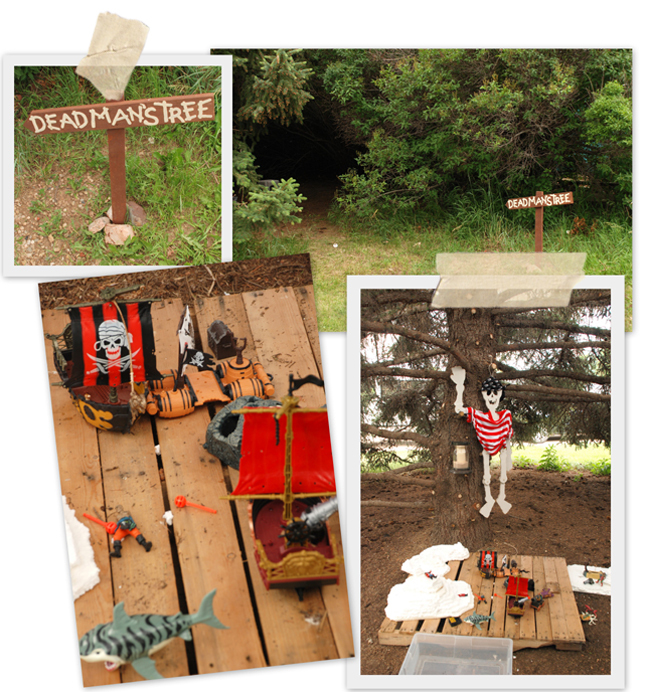 Dead Man's Tree was so much fun. Branches were cut and cleared out under a huge pine tree creating a magical hollow where the kids played with pirate action figures. I remember crawling under that tree as a little girl pretending it was my secret hiding place. It was really great seeing my kids play under there, too-- pure magic! Now that it is trimmed and cleared out, adults can go in and even stand up! From the outside you would never guess there was so much room. Dinner was served at a long table under three white tents. Pirate lanterns and seashells decorated the table, and candelabras were hung under each tent. We had a yummy variety of toppings to put on our hot dogs. I never thought peaches would be good on a hot dog but I was surprised to find that, combined with the right toppings, it was my favorite. It was delicious! For dessert we ate red white and blue dipped strawberries. I loved these! Just looking a the pictures makes my mouth water. (My friend, Liberty, created an amazingly fun pirate cake--complete with chocolate cake ship with sails, and swedish fish swimming in the "ocean", but I neglected to get a good picture of it). I took it upon myself to make sure everyone was tattooed. It was really a fun little quest of sorts. I went around with a paint brush and a bottle of black craft paint and asked if anyone needed a tattoo. My brother-in-law Jon got really into it and came back more than once for more tattoos. 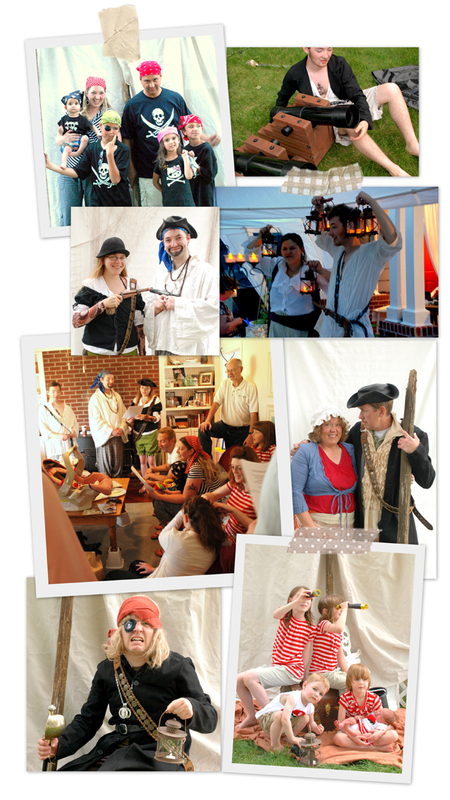 I manned the photo booth where people dressed as pirates to pose for the camera. Many of us just wore the costumes we came in and that made it even better! Everyone got really creative. Some came in hand-sewn, cute matching outfits and others came in thrift store finds that looked super authentic. The photo booth was pretty popular and by the end of the day my feet hurt from standing behind the camera almost the whole time. Then Jon (my brother in law who happens to be a superb actor) took all the kids on a treasure hunt! He spoke like a pirate and was in character the entire time...it was pretty hilarious! I didn't get any photos of it because it was at the point where my feet hurt and I didn't want to stand any more. I think this is the best reunion party we have had so far! We all got really into it and had a great time! I can't wait 'til next year! yay! you win for the best party round up ever. Was a great year, wasn't it? That looks like so much fun! Your family inspires me to start something similar with mine, now that we are all getting older, we need a reason to gather! I think a reunion party like yours would be the perfect carrot to dangle in front of my brothers! Your pictures are fantastic too! I could gush and gush, seriously, you are always such a sweet inspiration, I am encouraged by your love for your children! It is lovely and delightful! I seriously love how awesome your family is. Your parents rock. I can't believe your dad engineered such cool cannons! What an amazing party! I love how you collage your pictures together and the tape is such a lovely addition. I'd love to see how you do that! You guys know how to party! That looks like it was a blast! Wow - how unique and looks like it was def absolutely FUN!! 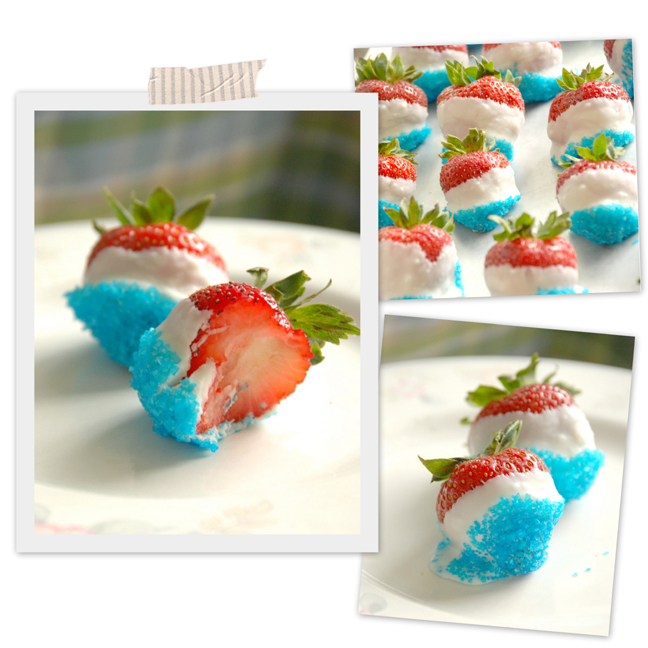 Thanks for sharing ur pics and I LOVE the strawberries desserts (red, white, blue .. geniusly delish!!!). Every detail is absolutely amazing!! Wow! the party pics look fab, especially the outfits! 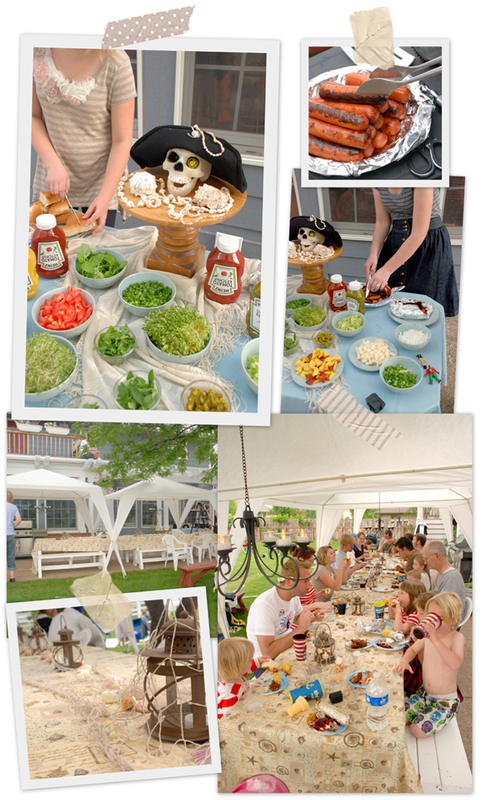 love the cannon and that all the family pulled together to make what looks an unforgettable party! ooooh who was Jack Sparrow?